ZTechnik's VStream® Windscreens for the BMW R1200GS/LC come in two sizes. 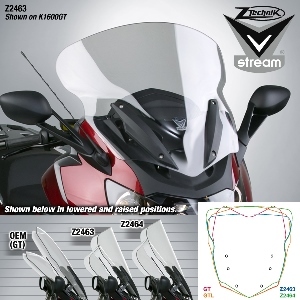 The Z2485 Dark Tint and Z2486 Clear Sport screens are reshaped in VStream's distinctive contour but similar in height to the OEM windscreen. The Z2487 Touring VStream is wider and taller than stock for superb touring performance. Tough FMR coated polycarbonate gives these VStream windscreens outstanding clarity and strength characteristics unmatched by any windscreen maker worldwide. They are 3X more resistant to abrasion than acrylic materials, and have 20X greater crack and impact resistance. Fit the BMW R1200GS LC 2013+. The Z2415A VStream® Windscreen is the premier wind management performer for the R1200GS. The comfort, clarity and durability are a great upgrade. 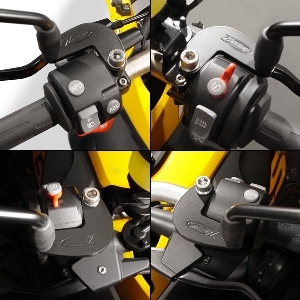 A unique lateral bracket adds torsional rigidity and includes an integrated accessory shelf with cut-outs to mount standard BMW® power outlets for connecting electronic accessories. 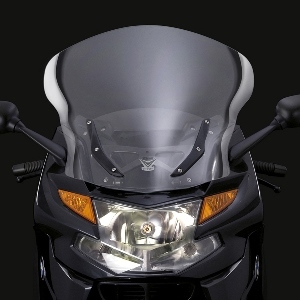 4.5mm FMR hardcoated polycarbonate gives this VStream windscreen outstanding clarity and strength characteristics. Factory rake adjustment is retained. ZTechnik’s new Z5200 LeverAction™ Rake Adjust Kit works with this windscreen. 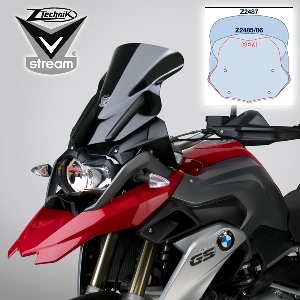 The design of the Z2242 R1200GS windscreen from ZTechnik comes straight off the Autobahn! 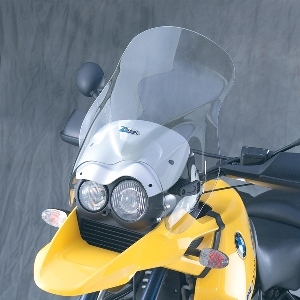 Made about 50mm taller, and 50mm per side wider, this windscreen is designed for highway wind and weather protection for the adventure rider who rides highways more than off-road trails. Substantially improved airflow is immediately evident. 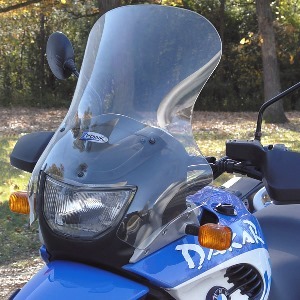 Beyond the increased size, this windscreen is made from 4.5mm FMR hardcoated Lexan® FMR polycarbonate. It resists everyday abuse and wears 100x better than the stock screen. And, it is optically distortion-free. Your ability to see the road is not compromised with this high quality screen. The Z2242 utilizes the OEM rake adjust mount points, which remain operational. The new size and optical quality of the Z2242 makes a measurable improvement over the stock screen. Try it with ZTechnik's Z5200 LeverAction™ Rake Adjust Kit. 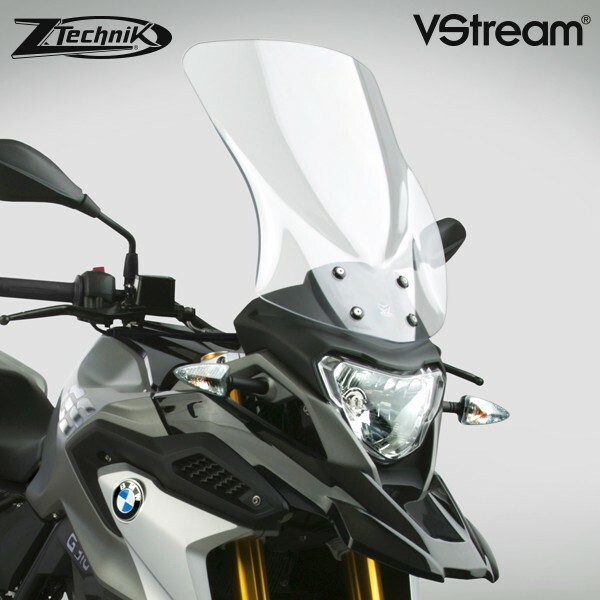 ZTechnik VStream® Windscreens for the R1200GS Adventure are given an aerodynamic flair to the bottom edge that is compatible with the hand guards. 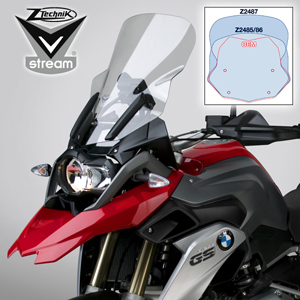 ZTechnik makes three different heights of R1200GS Adventure screens so riders can tailor their wind protection and comfort needs to their style of riding. 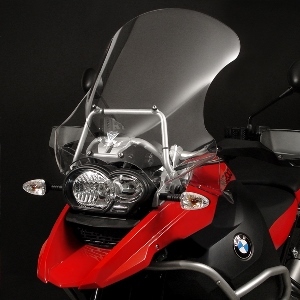 The touring sized Z2416 windscreen, 10.32cm (4") taller than stock and the extra tall touring sized Z2418 windscreen, 15.48cm (6") taller than stock, brings VStream comfort, performance and durability to the R1200GS Adventure. The sport sized Z2420 is just 24mm taller than stock, but with VStream's distinctive flair and comfort and wind management. 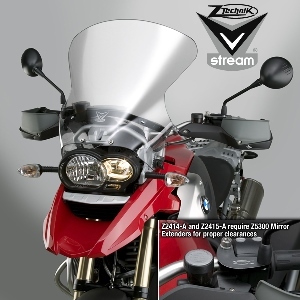 On all VStream windscreens for the R1200GS Adventure, the factory rake adjustment is retained. All above screens are covered by ZTechnik's 3-Year Warranty against breakage. 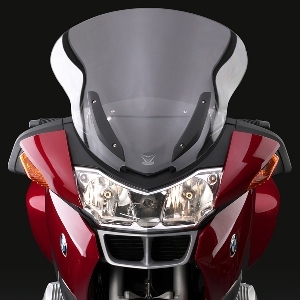 Fit the BMW R1200GS 2004-2012. Material: 4.5mm Lexan® Polycarbonate. FMR Hardcoated. 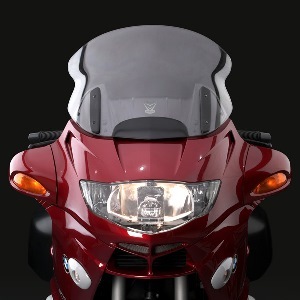 Fit the BMW R1200GSA 2005-2013. Give yourself a better view of the road and the vehicles behind you. 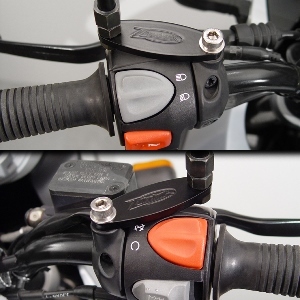 ZTechnik Mirror Extenders move your bike's mirrors out an additional 52mm (2") on each side, allowing you to see more easily past your shoulders, your passenger and your gear. Competitive extenders only add less than 35mm on each side. Made from Black Powder-coated Steel. Mounts into existing mirror holes. Holes are pre-tapped for new mirror location. 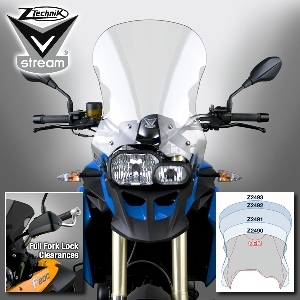 ZTechnik's wide range of VStream® Windscreens for the F800GS and F650GS Twin means there's a perfect size for every rider. 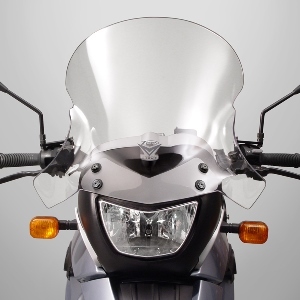 These screens use the bike's existing mount points, with additional slotted mounting points on the headlight. 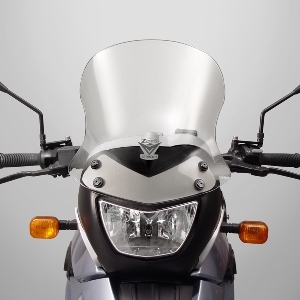 Complete adjustability of headlight is maintained while increasing the rigidity of the windscreen at high speeds. Tough 4.5mm FMR coated polycarbonate gives these VStream windscreens outstanding clarity and strength characteristics unmatched by any windscreen maker worldwide. They are 3X more resistant to abrasion than acrylic materials, and have 20X greater crack and impact resistance. Fit the BMW F800GS/F650GS Twin 2008+. Give yourself a better view of the road and the vehicles behind you. ZTechnik Mirror Extenders move your bike's mirrors out an additional 52mm (2") on each side, allowing you to see more easily past your shoulders, your passenger and your gear. Competitive extenders only add less than 35mm on each side. Mounts into existing mirror holes. Holes are pre-tapped for new mirror location. All hardware included. Take away irritating wind noise, fatigue, debris, and rain with ZTechnik's generously sized, FMR hardcoated Lexan® polycarbonate Replacement Screen. 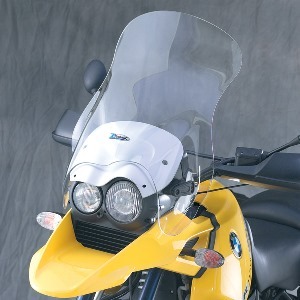 This R1150GS screen is designed to smooth out wind turbulence, protect you from the elements, and offer you a viewing area with superior optical quality to keep you comfortable during your ride. The Z2240 is actually 100% larger and 18.06cm (7") taller than stock. R1150GS Adventure models require additional BMW parts for installation. 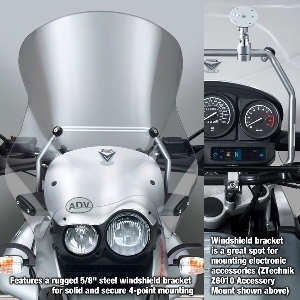 If you are a shorter rider, or looking for a sportier look, ZTechnik's Z2241 may be just the right alternative to the Z2240 Replacement Screen. The Z2241 is still wider and 10.32cm (4") taller than the stock windscreen for a significant improvement in wind protection. Like the Z2240, it features FMR hardcoated Lexan® polycarbonate strength and excellent optics. Up-to-date VStream® style, durability and performance are now available for the R1150GS Adventure. This windscreen's rugged 5/8-inch steel lateral bracket adds stability and strength with two additional mount points for solid and secure 4-point mounting. The bracket can also be used with our ZTechnik Accessory Mounts for holding radar detectors, GPS units or any other electronic accessory. The Z2422 measures 9.03cm (3.5") taller and 9.675cm (3.75") wider than stock, and is geared for touring or maximum wind protection. The Z2423 is a standard height screen for the R1150GSA but adds 5.16cm (2") of extra width over stock. This is a great choice as an everyday windscreen. Fit the BMW R1150GS 1999-2003. 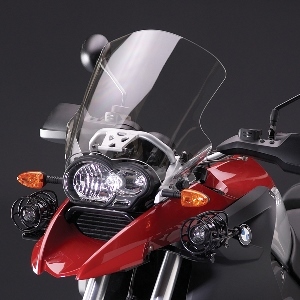 Fit the BMW R1150GSA 2002-2005. VStream® comfort, performance and durability are available for the F650GS rider! Compared to the OEM windscreen, the Z2412 measures 7.224cm (2.80") taller and 2.58cm (1.00") wider. The taller ZTechnik Z2413 offers significantly more coverage and wind protection, and will be a superior performer on long tours or in cold weather. The unique cut and flair designed into the Z2413 VStream gives this screen a big advantage over stock. ZTechnik's Z2413 measures 12.9cm (5") taller and 11.61cm (4.5") wider than the OEM windscreen. That's a big improvement! These ZTechnik VStream windscreens use the bike's existing windscreen mount points, and are compatible with the OEM handguards. ZTechnik's Z2263 & Z2264 will provide great looks and enhanced wind protection for years to come. These screen feature a more upright angle and an innovative shape to ensure a bigger air pocket and smoother airflow behind the screen. The result is a noticeable reduction in wind noise buffeting. Lexan® polycarbonate construction offers 23X more crack resistance and 20X more impact resistance than the acrylic or "aircraft plastic" used in most after-market screens. The tough FMR hardcoating, meanwhile, offers 3X the abrasion resistance of most acrylic screens. The thick material and precision shape make this a handsome windscreen for the F650GS Dakar. Made from 4.5mm thick Quantum® hardcoated polycarbonate for unbeatable scratch resistance with unmatched strength and durability. Fit the BMW F650GS Dakar 2005-2007. Fit the BMW F650GS Dakar 2001-2004. Fit the BMW F650GS 2001-2004. Fit the BMW F650GS Dakar. VStream® comfort, performance and durability are available for the rider of the new exciting kid on the block - The BMW G310GS! 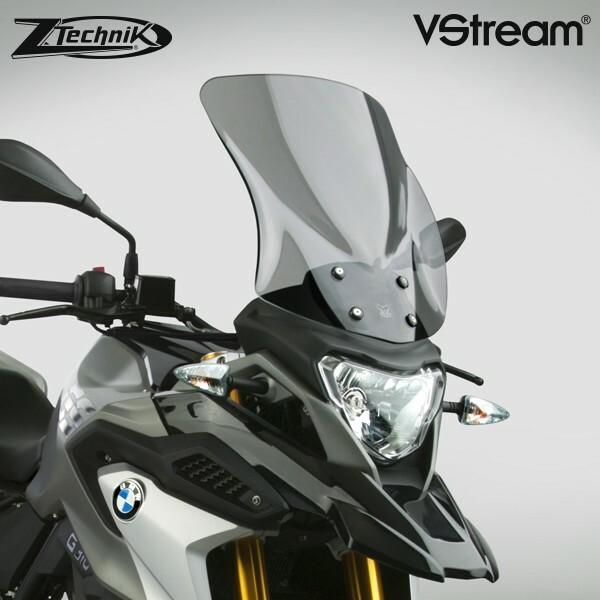 VStream® revolutionizes windscreen performance! The advanced "V" shape and dimensional contours push the wind vortex out and away from the rider's helmet, resulting in a peaceful, quiet environment. This improvement is notable for the passenger as well. Three different screens are available. The Z2360 is an aggressive-looking adventure dark tinted sport screen, and gives the G310GS rider good wind protection without sacrificing the cutting edge, aggressive appearance. The Z2361 is a mid-sized adventure light tinted sport/touring screen, and gives the G310GS rider extended wind protection. It's an excellent choice for commuting or shorter tours. The Z2362 is a tall-sized adventure clear touring screen, and is a great choice for taller G310GS riders or for those planning a long tour. 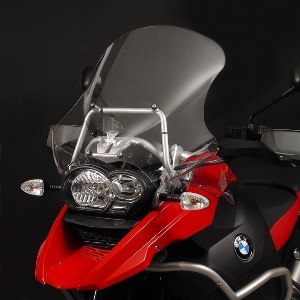 State-of-the-art 4.5mm Quantum® hardcoated polycarbonate gives this VStream windscreen outstanding clarity and strength characteristics unmatched by any windshield maker worldwide. This exclusive combination of Quantum and polycarbonate is 30X more scratch-resistant than acrylic materials, has better UV life, chemical resistance, and optical definition, and has superior crack and impact resistance. All these screens are covered by ZTechnik's 3-Year Warranty against breakage. VStream® revolutionizes windscreen performance! The advanced "V" shape and dimensional contours push the wind vortex out and away from the rider's helmet, resulting in a peaceful, quiet environment. This improvement is notable for the passenger as well. The Z2452 makes a great touring bike even better! If you want the ultimate touring screen with all-day riding comfort, this is it! The Z2452 VStream does much more than effectively redirect wind ‐ its quiet air pocket allows you to use your communication system with ease and, at the same time, stay warmer on those long, late-season rides. The Z2453 is a 6.45cm (2.5") taller and slightly wider version of the Z2452, for taller riders or for those wanting extra wind protection. The up-sized Z2463 for the ground-breaking K1600GT is 2.58cm (1") taller (centreline measurement) and 8.385cm (3.25") wider than the OEM GT windscreen, and is perfectly proportioned for riders up to 6'0" (183cm) tall. Taller riders will appreciate the greater coverage of the Z2464, which is 9.3525cm (3.625") taller and 9.675cm (3.75") wider than the OEM GT screen. Both riders will find that turbulent air is deflected over their helmets, reducing wind noise and creating a pocket of calm, quiet air. State-of-the-art Quantum® hardcoated polycarbonate gives these VStream windscreens outstanding clarity and strength characteristics unmatched by any windshield maker worldwide. This exclusive combination of Quantum and polycarbonate is 30X more resistant to abrasion than acrylic materials, has better UV life, chemical resistance, and optical definition, and has superior crack and impact resistance. 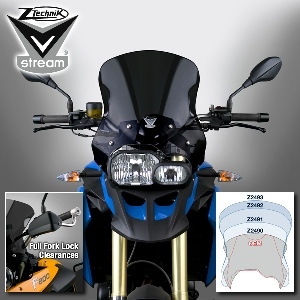 VStream® revolutionizes windscreen performance! The advanced "V" shape and dimensional contours push the wind vortex out and away from the rider's helmet, resulting in a peaceful, quiet environment. This improvement is notable for the passenger as well. State-of-the-art 6.0mm Quantum® hardcoated polycarbonate gives this VStream windscreen outstanding clarity and strength characteristics unmatched by any windshield maker worldwide. This exclusive combination of Quantum and polycarbonate is 30X more resistant to abrasion than acrylic materials, has better UV life, chemical resistance, and optical definition, and has superior crack and impact resistance. ZTechnik now offers VStream alternatives for riders who are taller than the average RT pilot. The Z2456 has all the same great features as the original Z2400, but with 5.16cm (2") of extra height. 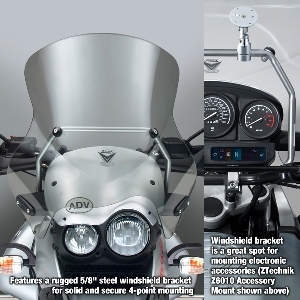 ZTechnik's Z2402 VStream® Windscreen, 5.16cm (2") taller than stock, will be the most versatile and appreciated wind management accessory you will ever purchase. It's so quiet that even your passenger will be able to hear the stereo. 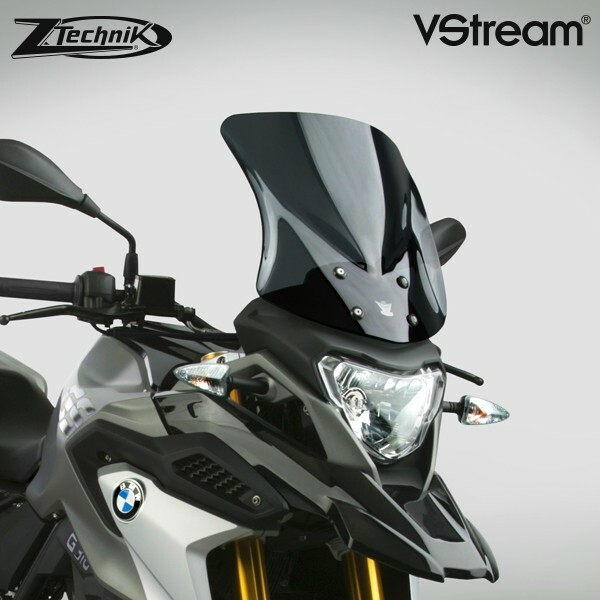 Every rider who has taken the Z2402 for a test ride came back and made the switch – to VStream. The Z2403 windscreen is 9.03cm (3.5") taller than stock and ideal for taller riders.